I thought I’d put up a more detailed example of an early totalist piece, to show precisely how composers started breaking away from minimalism in the early 1980s. Mikel Rouse’s Quick Thrust of 1984 is a work that both reaches back into minimalism’s most formalist concerns and also forecasts ideas that would later become widespread. For one thing, it was one of the first fully notated pieces for a pop instrumentation, written as it was, like most of his music of the ‘80s, for his rock-instrumentation quartet Broken Consort, consisting of soprano sax, electric keyboard, electric bass, and drum set. Secondly – it’s a 12-tone work. The composers whose work would later be called totalist loved minimalism’s formalism, hard-edged textures, reduced range of materials, impersonality, and amplified ensemble concept, but were not much enamored of its pretty, diatonic tonality (at least as manifested in the work of Reich and Glass). Few turned to 12-tone technique, nor did Mikel ever repeat the experiment as far as I know, but Quick Thrust is a bona fide piece of 12-tone totalist rock – perhaps the only one. Thirdly, Quick Thrust is an example of music drawn from Schillinger technique, for Mikel studied with a Schillinger specialist when he came to New York in the early 1980s. Today Joseph Schillinger’s technique is more widely known by reputation than example, but in the 1930s and ‘40s, it was particularly picked up by Tin Pan Alley composers as an aid to churning out music in a hurry. Gershwin studied it; so did, later, Earle Brown. (Schillinger’s hefty two-volume exegesis of his methods is forbidding, but quite clear if you persevere. It tends to introduce a new principle and work its way up to a musical example, and is actually easier to follow if you kind of start with each musical example and work your way backward to the principle.) The technique is based in a faith in the ability of number systems and arithmetical techniques to generate musical forms of innate aesthetic attractiveness, and some of its devices had been presaged in Henry Cowell’s precocious book New Musical Resources. Note that the 12-tone row is run through the eight-note rhythm in a phasing relationship, the pitch row and rhythm row returning to their original relationship every 24 notes. This is, of course, a recurrence of medieval isorhythmic technique, in which a pitch row (called a color) and a rhythm (called a talea) go out of phase with each other. The practice was the structural basis of the 14th-century motet, died out around 1450, and was resurrected again by Messiaen in the first movement of his Quartet for the End of Time (1941) and Study No. 7 by Conlon Nancarrow (early 1950s). It has appeared in several totalist works, my own Desert Sonata (1994) included. I emphasize that this piece represents one of the initial starting points of what has been called the totalist, or metametric, movement. Like so much postminimalist music of the early ‘80s, it is minimalist compositionally, but not perceptually. Its repetitiveness is intricately disguised. Its strict processes are not linear but global, real to the composer but not heard by the listener. (Many movements of Bill Duckworth’s earlier Time Curve Preludes are similar in this respect.) Quick Thrust is a fantastically clear example of a certain kind of rhythmic and structuralist thinking that was pervasive, “in the air,” in the mid-1980s among a certain kind of minimalism-impressed-but-not-quite-impressed-enough composer – not characteristic of the totalist movement as a whole, but quite typical of several months in 1983/84. This kind of intense structural fanaticism was soon left behind. Number patterns remained in use in the works of many composers, such as Michael Gordon, Art Jarvinen, Rhys Chatham, Glenn Branca, Ben Neill, Evan Ziporyn, Diana Meckley – but usually in textures of more intuitive freedom. The interference of periodicities became the basis of the fifth movement of Chatham’s An Angel Moves Too Fast to See, at least part of Branca’s Sixth Symphony “Devil Choirs at the Gates of Heaven,” and several pieces of my own in the ‘80s, most concentratedly my 1987 piano piece Windows on Infinity – though my interest was always in longer time stretches and larger prime numbers, with events occurring every 53 8th-notes, every 71, every 103, and so on. When Mikel heard a concert of my music by Essential Music in 1989, and I heard his Quick Thrust and other Broken Consort works soon afterward in 1990, we got together, started talking, and realized that we had been on the same track. You could look it up. Subsequently I wrote about Quick Thrust and other works with similar rhythmic tendencies in an article in a 1994 issue of the academic journal Contemporary Music Review. Possessing entire file cabinets full of unpublished scores by composers of my generation, I could write another article like this every month. But very few people have seen that article, and articles in academic journals pretty much disappear into libraries, to be scoured at rare intervals by the occasional researcher. I’ve got tenure, I don’t need any more resumé lines, thanks. Now that I can put both score examples and recordings on the internet, I would far rather publish here, where I am am actually read. And since few people who weren’t immediately involved in the scene were aware of techniques used by the music I’ve spent my life writing about, I hope that with this method of presentation I can bring the underground history of the 1980s and ‘90s out into the open and help the world catch up. Does it sound like I’ve finally begun that book on Music After Minimalism that I’ve been threatening for years? I guess I have. Valuble analysis, Kyle. I knew Gershwin had worked with Schillinger, but had not known that he gravitated towards similar techniques before studying with him. And I’ve never heard the Schillinger technique described in any real detail before. I suspect there is still some life to 12-tone techniques. It’s like anything—depends what one does with it. Still, the utter dependence on it I think is done and buried, but some serial techniques creep into my current work, and I suspect that of others as well. But not in a major way, unlike earlier stuff. I remember that I had written a twelve-tone piece for vibraphone, soprano and piano in the early 80’s that used the fibonacci sequence to derive its rhythmic structure. I believe that Bartok also used fibonacci-related structures in many of his pieces, so perhaps he was a predecessor to totalism? KG replies: Well, everyone of my generation (which I believe includes you) learned that Bartok used Fibonacci numbers as a structuring device, and so there was a lot of it around in the ’70s and ’80s – Time Curve Preludes is another piece largely based on them. But since Bartok only used them in terms of section length, phrase length, and harmony, rather than having anything to do with tempo, it’s not a conclusion that I, myself, would jump to. There was a fairly well known group in the 70s called Weather Report that had a similar sound (although much more traditional metering). “Quick Thrust” reminded me a bit of Weather Report’s “Mr. Gone”. I wonder if there was any connection apart from the similarity in voicing? Interesting, anyway, to find out that the successor to the static eigth note pulses of the minimalists actually had a well-thought out form and structure. i’m glad you’re publishing these tiny histories. i’ve been interested in the same sort of number things, myself, and it’s good to know what happened while i was too young to be aware of it. so, thanks! that was a neat piece. gives me some ideas – although i’d: have more pitch variation; use two high-gain electric guitars; have expanded drum work, including dbl kick, kick/crash and china combos, and tom work. KG replies: Assure me that you would have done all that in 1984, and I’ll acclaim you as a genius indeed. If this turns into a book, I’ll buy it. It needs to be written. I think that this is a perfectly good medium for articles of this sort, and I hope you keep doing it. These compositional techniques deserve to be more widely understood, and there’s no reason why they can’t continue to provide inspiration. The rhythmic analysis is particularly interesting to me, which is ironic given that the stuff I’m doing currently is completely arrhythmic, except in the sense that duration can be considered a rhythmic element. Likewise, I love the Fibonacci series, but am using it horizontally (e.g., to determine which partials are used to build a composite waveform) rather than vertically. Hmm… after quite a bit of trying, I haven’t found a way of saying “PASS the GOD-damned BUTter” that fits that 3 against 4 rhythm. It keeps turning into either a six-beat pattern or a ten-beat one. How are you saying it? KG replies: This would be easier with notation, but I don’t want to clog up the page. Three beats to the measure: PASS on beat 1, GOD on beat 2, BUT on beat 3. 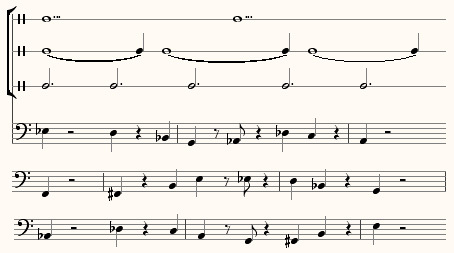 “the” is on the fourth 16th-note of beat one. “damned” is on the 2nd 8th-note of beat two. “ter” is on the second 16th-note of beat three. kyle, i wasnt implying any kind of personal ability, but rather stylistic preference; curious that you conceive of such a thing. as for 1984, i was only 12 or 13, then; i didnt even start playing guitar till i was nearly 21.
however, the mnemonic did make sense to me; i just thought of the words overlapping, vertically. lastly, i forgot to share in gratitude for this kind of presentation and sharing. thankyou. (ii) eg: 3 beat cycle taking the same time (in seconds) as a 4 beat cycle, which I call 3 *into* 4. Not being particularly good musicians (despite some 20 years playing! ), we find the miracle of digital editing a godsend, allowing us to stripe exact guide tracks to achieve (ii) (we’ve been doing (i) on and off for years, and not always on purpose, especially when improvising!). I know of other groups (Meshuggah, some of the ‘brutal prog’ bands such as Hella etc), but I think they are more ‘linear’, rather than interested in density. We are doing stuff now that couldn’t be done live, because it relies on several overdubs of the entire band to work (though I have fantasised about having three bands, each with their own click track, playing simultaneously…). This also comes back to us being not that technically brilliant, as we can generate complexity from overlaying several simple, xenochronous (xenometric??!) parts. Thanks for the stimulation / encouragement. I feel the need to stand as a non-composer voice from outside, again. I’m thinking of another area in which complicated rhythmic structures showed up at nearly the same time as you are writing about. It began before Eric B. & Rakim and the overwhelming layering of sounds and rhythms by Public Enemy, though they were people who made it popular. Underground hip hop was going through the same movement as you describe in the early 80s (even as popular hip hop was mashing together Aerosmith and Run-DMC, but even there you see polyrhythms showing up). It wasn’t just in the air due to minimalism. Or, well, with the role that groups like Kraftwerk and their “minimal” synth rock played in hip hop, perhaps it was. Who knows. so: yes! please! more! thank you! I know of other groups (Meshuggah, some of the ‘brutal prog’ bands such as Hella etc), but I think they are more ‘linear’, rather than interested in density. We are doing stuff now that couldn’t be done live, because it relies on several overdubs of the entire band to work (though I have fantasised about having three bands, each with their own click track, playing simultaneously…). I think one of the most interesting thing about the “brutal prog” bands is that with only one exception that I can think of off the top of my head (some incarnations of Upsilon Acrux), they tend to have very small lineups—two people is definitely the most common—and don’t seem to resort to overdubbing much at all That might account for some of the linearity you’re talking about, though if you got Zach Hill and Mick Barr in the same they could probably do something pretty stunning. This also comes back to us being not that technically brilliant, as we can generate complexity from overlaying several simple, xenochronous (xenometric??!) parts. This is the same thing that Zappa occasionally did with some of his solos; I think he called it xenochrony. I think the linearity thing possibly has as much to do with the traditionalism of punk and/or metal that privileges (sp?) the live experience. Prog and Metal also place high emphasis on ‘musicianship’ (read the Meshuggah forum about the use of sampled/programmed drums on ‘Catch 33’). I assume that this is as a reaction to the ‘manufactured’ nature of pop music – metal/punk is ‘proper’ music played by ‘proper’ bands. We are a trio, and we overdub. In fact, I’ve always made a distinction between the live and recorded manifestations of us (especially now we don’t improvise). Zappa certainly did use ‘xenochronous’ (greek ; ‘alien time’) solos. I also read a late interview with him where he explained about his work with ‘dissonant’ polyrhythms such as 23/24. As this was synclavier stuff, I assume he meant the type (ii) polyrhythm of my definitions. He was a big Varese fan, of course. Thank you for this very nice article! From time to time I’m searching the web for something new about Schillinger and this time I was very pleased to find this interesting page. After listening to “Quick Thrust” I remembered that a friend once told me that Schillinger’s idea was to parameterise a composition in a way to evoke specific emotions in the listener. “Quick Thrust” is a very interesting piece of music, but I wonder if it can really touch you. To me it sounds rather abstract and academic, and yes, somewhere between Weather Report and Zappa. Hmm. I think hearing those “strict processes” – at some level – is essential to a successful listening of “Quick Thrust.” Mine anyway. The sense of differently scaled elements in play, being pulled inexorably into a sort of “rhythmic wonder” trying to divine them, enjoying the complexity of the result… Otherwise, it’d just be an aleatoric jumble. Minimalism for connousseurs! Or maybe it’s just the way I listen; gotta love that Afro-Cuban.